Champion is a special place where people go to feel reconnected with the good ties to the past. It is also a place where a person can develop a good perspective on his place in the big world. With the exception of the relatively few Native American people who still live in this Nation, everyone here or their antecedents came from elsewhere and are therefore connected to the whole rest of the world. Champions are aware that more that 150,000 people have just died in Haiti. In 2008, the estimated population of Douglas County was 13,483. Now there is some perspective. Good news in Champion comes from the Brixie clan. Jacob Kyle Brixie was born Monday evening, January 18th, at 6:01 to Jana and James Brixie. His paternal grandfather is Robert Dean Brixie who now lives in Mountain Grove and his maternal grandparents are Gary and Nyalin Barnes also of Mountain Grove. He’ll have to share his grandparents with his older sister Jenna Kateland, but there is every reason to believe there will be enough love and fun to go around. Grandparents are Champions! Another note came from Wally Hopper the other day. It included an article from his local newspaper concerning his grandson, Jacob Hopper, who had just completed his boot camp Marine training in San Diego. While he was in Republic visiting family before going on the Camp Pendelton for more training, he happened into an unusual situation. A serial thief had been breaking into cars in that part of Republic, the police said as many as twenty-five cars. He noticed this man hopping fences and running away from a police car. Hopper and his brother-in-law followed the guy in their car for a distance, then Hopper jumped out and ran the thief down just before he got to the highway. “The Marines pride themselves on being very physically fit,” said the Private First Class. Wally was a Marine himself and proud already, but this grandson! Wally will have all of his vest buttons popped off soon! Champion! Albert E. Brumley wrote “Turn Your Radio On” and eight hundred other songs including “I’ll Fly Away.” Kalyssa and Foster Wiseman do an excellent job with that tune as did their Granddad, Lonnie Krider. There is a CD circulating around of Lonnie and Wayne Anderson that was made down in Squires several years ago at the Relay For Life program for the American Cancer Society. They helped raise a lot of money for the cause. That CD has made it into the hands of the music director of the new public radio station over in Cabool. For Champions willing to prize themselves away from Old Rush for a little while, they can check out KZ 88.1 on the FM dial. This is a listener-supported station with over half of their programming currently produced locally and featuring local people, organizations, musicians and artist. From ten a.m. until noon on weekdays Butch Kara hosts a program called Kaleidoscope. He plays all kinds of music including folk, world music and bluegrass. Champions will be listening in for the chance to hear Lonnie again as well as other local musicians who are encouraged to submit their work by CD or cassette to KZ88 1211 Ozark Street Cabool, MO 65689. Check in on the schedule of programming at KZ88.org or listen to live streaming at mykz88.com. It turns out that another Krider grandson, Dillon Watts of Murfreesboro, TN has taken up the banjo. Most likely Champions will be turning their radios on for him one of these days: “And listen to the music in the air.” Champion! On Monday snow was whisping through the air driven by a hard wind even as eagles were soaring over open fields and some gardeners were getting ready to plant their onions. Some are trying onions from seed for the first time and the process is a little daunting. It seems that the main thing is to maintain a fairly even temperature and moisture level until the seeds sprout. They take several days. Linda’s Almanac from over at the Plant Place in Norwood indicates that the 28th and 29th will be excellent days for starting seedbeds. The Plant Place will open up again next week and the Almanacs for February and March will already be available. Some gardeners are hauling manure and cottonseed meal and other things to spread over their gardens. Others are just planning to do that sort of thing someday when the weather is more pleasant. It seems that as some gardeners get older they are more likely to put off the hard work. Some are still daydreaming about Lem and Ned and checking the bulletin board down at Henson’s Store to see if they have put up their notice that they are available for ‘choreing.’ Some sweet juicy turnips will surely lure them out again soon and they will be prowling the countryside looking for hard work that husbands do not really want to do: shoveling manure, cleaning out chicken houses, digging new outhouse holes, getting the grass out of the flowerbeds, stacking rocks, hauling brush and the like. Champion ladies are getting excited about the Skyline Volunteer Fire Department Ladies’ Auxiliary meeting that will be held on February 2nd at seven in the evening down at Henson’s Store. It will be their first chance to see the quilt that will be one of the features of the annual chili supper that is scheduled for March 6th. In addition to covering all those important details of menu and entertainment, the meeting will be the first opportunity for members to pick up tickets to sell for a chance to win the quilt and to report on the various interesting things already collected for the silent auction. There will be a like-new Mirro pressure pan, a vintage J.C. Penny stationary bicycle, an oak clock and a variety of things as yet unimagined. The www.championnews.us site is getting some fine attention. David Richards of Mountain Grove said that he looks at the site all the time. He and a group of his friends were out riding their four wheelers on Sunday and paused to get their picture taken in front of Henson’s Store. There were about a dozen of them on their machines and a Kawasaki Mule. The mule goes along on these outings to carry a little extra fuel in case some rider runs out, and to carry some dry clothes and other necessities in case a rider gets wet out on a cold day. 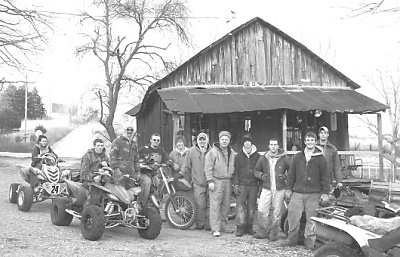 They are mostly from around the Norwood area and they get together every month or so just to tour the back roads on their ‘machines.’ Fortunately, they go different places all the time so there is no one spot that gets over-treated to their noisy boisterousness. They are a rowdy bunch but well behaved and are just out for fun. Champions don’t mind seeing them coming…..or going! They are not unlike the trail rides that come through Champion in the spring and fall, except for the speed and the noise. They don’t leave any ‘signs’ behind the way the horses do, just circles in the dirt where they have been cutting doughnuts. Someone suggested that the Neighborhood Events page of the www.Championnews.us should include birthdays on it. To that end several will appear for February…Charlene Dupree of the Gift Corner in Norwood will celebrate her birthday on February 2nd, as will Judith Parsons from over on the other side of Ava. Later in the month, after St. Valentine has his day, Staci Cline 4th grade teacher at Skyline School will mark another anniversary. Anyone who would like to have a special day noted can do so with an e-mail to Champion News or a note to Champion Items Rt. 2, Box 367 Norwood, MO 65717. Note how many notes you sing out on the porch at Henson’s Store. The wind chime there replicates the notes of the meadowlark. How pleasant a sound is that! It’s Champion—Looking on the Bright Side! Champion is a privileged place. No resident or visitor however casual or important can deny it. Even the National Resources Conservation Service has used Champion as a source and inspiration. Champions know the NRCS to be part of the United States Department of Agriculture. A soil scientist from Wisconsin traveling in these parts wrote, “It sticks and stacks, It squeezes through cracks between your toes goes mud. It plops and drops, and oozes and goozes. Thick or thin it’s mud!” The piece goes on to extol virtues of mud and what a glorious and wonderful thing is mud. Champions agree that a little dirt cannot hurt and yet, while still not at all complaining, they indicate that they prefer their mud a little warmer. Excellent good news comes from Betty Shelton who is mending nicely from having broken the ball off her right arm bone back just before the bad weather hit. The doctor says it is mending beautifully and she was out celebrating on Friday night with a good dinner over at Plumber’s Junction where her friends there surprised her with a lovely card and some good wishes. She said she was “floating on a cloud.” Good news and good wishes must surely help the mending process. Barbara Krider has had an arthroscopy procedure on her knee and is making a splendid recovery. Hopefully she will be in the neighborhood soon to lead the final perlustrations down Lonnie Krider Memorial Drive to determine where the signs will be placed. Her sister-in-law is feeling better over her fall on the ice and things in Champion are just humming right along in the most pleasant way. No complaints. More good news comes from Ed Bell a Champion son-in-law and always-welcome visitor. He has made the Dean’s List at Drury University. Friends and family who love him are not at all surprised. Wally Hopper sent a note (Champion Items, Rt. 2, Box 367, Norwood, MO 65717) to say, “PFC Jacob Hopper has completed training at the US Marine Corps Depot in San Diego, CA. He graduated with honors and was Guide On of his platoon during the complete time of training. He will return to Camp Pendleton for further training in Security and Infantry. His Security duty may include the Washington DC area. He is the son of Wally Brian and Janet Hopper and the grandson of Donna and Wally Hopper, who was also a Marine from 1953-1956.” Champions stay mindful of those who serve the Nation with Love and Gratitude. Bill Pool sent an e-mail (Champion News) to say that two weeks ago he had opened an attachment to an e-mail that contained a Trojan virus that killed his computer. His daughter, Kathy, had called him to report that her friend in K.C. had received an e-mail that supposedly had a UPS shipment tracking number in it. When opened, it had a virus that ruined her computer and her security system was powerless to stop it. His advice is to be very cautious about what you open. On your way into Henson’s Store in downtown Champion, take just a moment to admire the impressive kindling box. Some tinkerer must be producing a lot of fine trinkets in a local woodshop. Champions are hoping that more of those trinkets show up at the silent auction at the Skyline VFD Chili Supper. A couple of craftsmen have been generous with their donations at this event in previous years and there is always exciting competition in the bidding for their special items. The Skyline Ladies Auxiliary will meet at Henson’s Store on the evening of Groundhog Day to get plans in the works for the March 6th Chili Supper. The years roll around so quickly. Lem and Ned are anxious to get in the mud and pestering Linda for an almanac already is just the start of it. As seed catalogues and orders go whizzing through the mail and the Internet and robins bob along it is easy to forget that a week ago it was fourteen degrees below zero in some parts of Champion! A warm day inspires impatiens. There is always plenty to do. Choosing the right thing to do is the trick. Those are some tricky guys. They kind of remind a person of the General who was loitering around Champion on Saturday, plainly interfering with the work of four grown men and a little boy as they replaced the roof on the well house at the church. The General’s wife (bless her) waved to onlookers and eventually was successful in persuading Himself to move along. Sometimes a break from the arduous labors of living in the country requires just kicking back and listening to some good music. When the Champion mentioned “I Traced Her Little Footprints in the Snow” last week, she was doubtlessly thinking of a sweet version of that song by Lonnie Krider. He had such a fine voice and such a good heart. A year has gone by since his untimely passing. A person may not know in his lifetime how many lives he touches and to what effect. Champions know what a gift he was to the community and beyond. His music still brings a smile. He will always be missed, but never forgotten. He was a Champion. Go to www.championnews.us to see some pictures of Lonnie and on that site to “Champion School Reunions” to hear him sing. Champion—Looking on the Bright Side! On Monday morning Champions were delighted to report temperatures a full twenty degrees warmer than the previous morning. It was all the way up to ten degrees and the prospect of more sunshine had spirits lifted high. A certain numerology aficionado said that on 01-10-10 it was ten below and on the binary palindrome of 01-11-10 it was ten above. This Champion has clearly had too many inside days and ought to be out doing good for neighbors instead of playing with numbers. Good neighbor Harley reached out all the way from Illinois to ask Champion sister-in-law Karen to bake a ham for Betty and J.T., which she did and then she had son-in-law, Dustin, deliver it, which he did with good cheer. Good Cheer is almost a second name for that guy, somewhere after Kid Prank. Children love him though, so he can’t be too bad. Betty is making a slow recovery from her broken arm and like many has been inside for more than a week. She said that the ham and vegetables were very good and she really appreciated the thoughtfulness of her neighbors. Just up the hill a way, Wilburn was having a birthday on Monday. He’s up the hill not over it at 76. Well, a person who would rather stay home and stack wood on his birthday than to go to town for lunch might be getting close to over the hill. Of course, with a cook like Louise, it is easy to stay home. They have managed to stay warm and cozy with their nice Hardy furnace though it really goes through the wood on these extremely cold nights. Fortunately, the furnace itself is under cover so it isn’t too bad to have to tend it. Others have been up all through these long nights feeding the fires. Champion North’s Sharon has been out busting ice on the ponds twice a day and distributing hay for the livestock. It was -14° at her house on Saturday night. She uses a splitting maul to break the ice because, she says, an ax is bad to glance off. Maybe the weight of the maul helps. She spreads ashes on part of her drive where a spring seeps and keeps freezing slick and she says she is glad not to have fallen. That is an easy thing to do. Foster’s Grammy took a tumble on Sunday morning and bruised her shoulder. A person’s feet can get out from under them quickly. Betty Dye up at Skyline has been being cautions, as well, and so far that family has fared well. The Griswolds are all in fine fettle with no complaints. Wilburn shares his birthday with Bob Leibert, herbalist neighbor from over on Teeter Creek. Jan had her birthday on the first day of the year. Kyle Barker and his Dad, Tom, both have a birthday this month, as does Elizabeth Johnston who celebrated with her folks on Saturday. There is to be a new Brixey in the mix as well. Jenna Kateland Brixie is to have a sibling soon. Jenna will be three in August so a brother or sister is showing up just at the right time. Miss Rachael Evans of Leichester, England celebrated her birthday on the ninth of January up in Edinburgh with Champion Sam Moses. She’s a charming girl, a flutist vocalist, who is described as looking like a Bottechelli painting. It is quite cold in the United Kingdom too, but they have their Love to keep them warm! Love and Gratitude get a lot of lip service from people who imagine themselves to be good—good people, good neighbors, good friends, good citizens. When the soldiers come home from their service to The Nation and need a helping hand or a sympathetic ear, then will be the proof of the pudding. Those safe and warm at home with petulant winter complaints need but to cast an eye to the military serving in the dangerous parts of the world to put their own suffering in perspective. Lem and Ned would say, “Turnips should be planted in the waning or decreasing moon (from Full Moon to New Moon) preferably during the first week.” So it is too late already this month to plant turnips—too early too, but Linda’s Almanac will be out soon to keep all the gardeners appraised of the best planting days, fishing days, harvest and pruning days and days to wean or transplant. It’s good to have a guide. Louise said that the freezing weather in Florida may have a real effect on grocery prices. Gardeners might have to get serious about their hobby if they expect to eat fresh vegetables this year. A nice phone visit from Deward’s daughter revealed that she had received separate letters from sister and brother Eva and Kenneth Henson both telling about having seen a bear in the field in front of their house when they were kids. Their dad, Ezra, and neighbor, John Bordner, shot at it and chased it into the woods west of the house. That was in 1950. In 1890 some of her folks down around Forsythe would hunt bears. Now there are a few (very few) in this part of the country again and it is a pleasure to her, as well as the current occupants of the old Ezra Henson place, to know that there are still bear around as well as the wonderful bald eagles. Champions have plenty to celebrate. A Champion stepped out the other morning to find Kalyssa’s footprints in the snow and it brought to her mind that song, “I traced her little footprints in the snow. I found her little footprints in the snow. 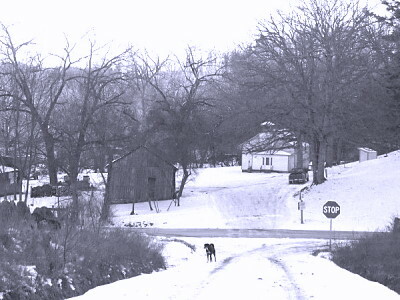 Bless that happy day when Nelly lost her way and I found her when the snow was on the ground.” Several have recorded it, but Bill Monroe’s version sets the standard. This batch of snow will soon be gone and some Champions will say, “Good riddance!” Others will miss the clean and tidy appearance of their yards as the clutter reappears in the melting. Voice your opinion, state your case, sing your song at Champion Items, Rt. 2, Box 367, Norwood, MO. 65717 or at Champion News. Unless you have a fine sonorous voice, finish your song up on the porch at Henson’s Store before you go on in. It is the polite thing to do. Champion—Looking on the Bright Side! Bright moonlight on a deep clean snow is one of those extraordinary sights that some Champions appreciate as a mystical event, as in their solitude in the perfect quiet of a cold clear night their memories of this very experience through the course of their lifetime flood in, even as thoughts of distant dear ones rush out, ah! that they all could share this splendor! Bright sunshine on that snow is also glorious and the blue shadows stretching out seem to be the repository of the cold. From inside it is all quite lovely as the contours of the hills become more apparent and details of hidden topography become visible. Wind whips snow from the frozen branches to swirl in a brief plume like whisps of floating smoke falling in a fringe. Champion farmers and merchants who must be out in the elements take all the precautions necessary to stay safe. They all remember to drink plenty of water when they come in from their exertions in the cold. Emergency space blankets in every vehicle’s glove box is a Champion notion. Complaint is relatively rare. Most of it comes from one relative. That relative’s relatives would like to make him feel better about winter, but he seems to like the grumbling. Maybe it is his personal heat source. A passing motorist spotted the General at 7:30 on New Year’s morning standing out in front of Plumber’s with a cup of coffee in his hand….“speaking with another gentleman,” reported the Champion motorist who wondered if the General was finishing up his previous night’s frolic or starting out on another one. As another year and decade stretches out before them Champions wonder what sorts of mischief and what kinds of shenanigans this neighboring rabble-rouser will incite. He has already been caught sneaking around shoveling the snow off neighbor’s sidewalks and driveways. One would think he was trying to become a Champion. Before the snow a Champion from over in Champion East was talking about her little kitchen garden. She raises it mostly in containers–all kinds of fragrant herbs, lettuces, table tomatoes and the like. She would like to have all the grass removed from the area and replaced with sawdust because it is such a chore to mow and weed eat around the containers and it would be nice not to have the exhaust fumes from the lawnmower and weed eater floating around her tasty food. Her visiting neighbor suggested to her that a couple of enthusiastic, energetic, self motivated, strapping young fellows with good attitudes and nothing else to do could probably accomplish that little chore for her in a trice. The gardener said that she had heard about a couple of young guys just like that and that they would work for just a couple of turnips! She, like many a Champion housewife, is In Search of Lem and Ned. Maybe they have a notice posted on the door down at Henson’s Store. Eighty two year old Champion, Al Nance, has written a New Year’s letter from his home in Scott’s Valley, California. He always has some interesting observations and he shared a poem that he had written twenty-five years ago called Facing the Year Ahead. Its final line is, “Lord, give us victorious living, each day of the year ahead.” Champions concur! A pleasant phone visit with Esther finds her well and with good reports of Ruby who had her granddaughter visiting, and of Sharon who was busy with her livestock. She reminds the Skyline VFD Ladies’ Auxiliary that the next meeting is scheduled for Groundhog Day. Esther is already getting excited about the music. She is a real music fan and particularly of live music of the local bluegrass variety. The Chili Supper is coming up the first Saturday night in March and Champions are looking forward to it already as a break from the cabin fever that will surely be rampant by then if the weather does not warm up! It is cold in the Middle East too. U.S. Service personnel serving in distant dangerous places have not just the inconvenience of inclement weather to contend with, but that great empty longing for family and home particularly during times of traditional homecomings and family gatherings. They have the Love and Gratitude of the Nation they serve. Host, Brushy Knob, was the clear winner of the first Fortnight Bridge game of the year. Vera Cruz, who is rarely the low scorer, took home the nickels and once again Champion was next to the bottom with Norwood outscoring her by a good six hundred points. The game broke up just as the snow began to fly and each of them enjoyed an exciting and uneventful trip home. Those are the best kinds. Bridge player, Charlene Dupre, has made a safe return from Florida where she enjoyed a fine holiday with granddaughter Olivia. She will be having a good sale at the Gift Corner to start out the New Year. “I made myself a snowball just as perfect as could be. I thought I’d keep it for a pet and let it sleep with me. I gave it some pajamas and a pillow for its head. 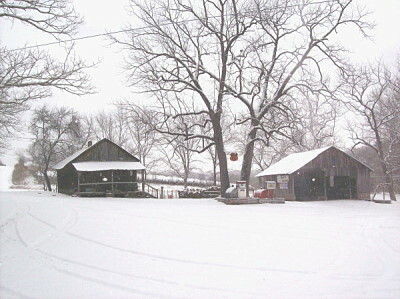 Then last night it ran away, but first it wet the bed.” Recite your favorite snow poem out on the porch at Henson’s Store. Then go on in and get warm around the stove. It is as if time is suspended there–very like walking into the past. News of Champions is always welcome at Champion Items, Rt. 2, Box 367, Norwood, MO 65717 or at Champion News. Look in on some old news at www.championnews.us. Or stay warm and cozy around your own little hearth. “Since we’ve no place to go, let it snow, let it snow, let it snow!” Dazzling light flashes through fancy icicles in Champion–Looking on the Bright Side!